Heat oven to 350°F. Grease 6 (6-oz) individual baking dishes (ramekins) with butter or shortening; place on cookie sheet. In medium bowl, beat 1/3 cup butter, the brown sugar and 3 tablespoons rum with electric mixer on medium speed until light and fluffy. Divide mixture evenly among baking dishes. Place in oven 10 minutes or until butter and sugar are melted. Place 1 pineapple slice and 1 cherry in each baking dish; set aside. In small bowl, with clean beaters, beat egg whites on high speed until stiff peaks form; set aside. In large bowl, beat 1/2 cup butter and the granulated sugar with electric mixer on medium speed until light and fluffy. Beat in buttermilk, 1/4 cup rum, the vanilla and egg yolks. On low speed, beat in flour, baking powder, salt and cinnamon. Fold in one-third of the beaten egg whites, then fold in remaining whites. Spoon batter evenly over topping mixture in baking dishes. Bake 25 to 30 minutes or until toothpick inserted in center comes out clean. Cool 5 minutes. Place small heatproof dessert plate upside down over each baking dish; turn plate and dish over. Let stand 1 minute so topping drizzles over cakes. Remove dish. Serve cakes warm. 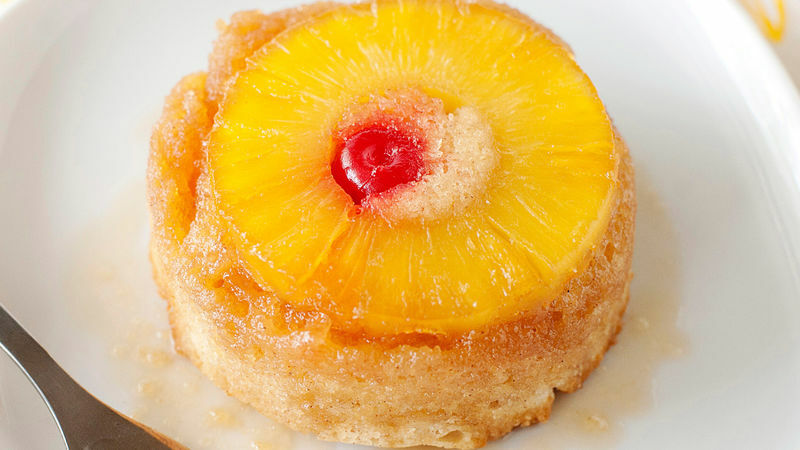 If you prefer to not use alcohol, omit the rum in the topping, and substitute pineapple juice in the cake batter. These cakes freeze well. Wrap individually in plastic wrap and place in a freezer plastic bag. Thaw and serve at room temperature, or warm in a low oven.